Last Friday night I had the pleasure of having dinner with two pretty women: Miss New Jersey (Lindsey Petrosh) and my wife Barbara. 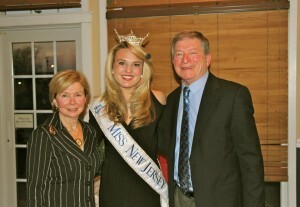 This took place at the Brigantine Jefferson Jackson dinner where Miss New Jersey sang the national anthem and also favored us with another song. What a fabulous voice! Lindsey sat at our table and she is a most charming representative of the Garden State.